Burning DVDs or CDs is a regular thing for most of the people but when it comes to free DVD burners there are small number of programs which do the work correctly. Also some free DVD burners offer advanced features in advanced UI which some users might find hard to use. Well here is a solution for all the problems,Ashampoo Burning Studio FREE is a well designed,user friendly and powerful DVD burning software which is available for free. The interface is combines user friendliness and all the features. You can move your cursor on the labels to see different options for burning your files to CD or DVD. Burn Data shows two options, one for burning a new disc and other is the option to update the disc.Backup + Restore tab shows options for creating a backup DVD and also restoring the backed up files from the DVD. This is one of the best features of this program because most of the other free burning software don't offer this. When open the music tab, you get a option to create a Audio CD. You can also create MP3 or WMA disc if you want.It can also help you copy your music files to Disc. Another interesting feature is Rip audio CD which can copy your music files from disc to your computer in MP3 format. Movie tabs unveils several features for creating video discs. Copy disc can copy you disc to another disc with ease. You can also burn image files such as your Windows and Office setup( if you have downloaded it from internet ). Create image from the disc will create a image file of whatever is in the disc. Erase re-writable disc allows you to delete all the data from your re-writable disc.You can control the speed of the burning process and also verify the data after burning is completed. Overall this burning tool provides all the top notch features in a single package available free.Burning discs should not burn you out. Ashampoo Burning Studio FREE has a comprehensive set of features. The only thing which annoy is the ads which are shown at regular intervals. But it does not hinder the capabilities of this tool. This is one of the best free burning software available till date. I can give a rating of 4.5 out of 5 for this fantastic program. It runs in all Windows versions, from the old XP to latest 8.1 both 32 and 64 bit.You can download it from here . "Many users are tired of over-complicated CD burning applications that are getting harder and harder to use. Sometimes you can waste most of your time just trying to find a function. 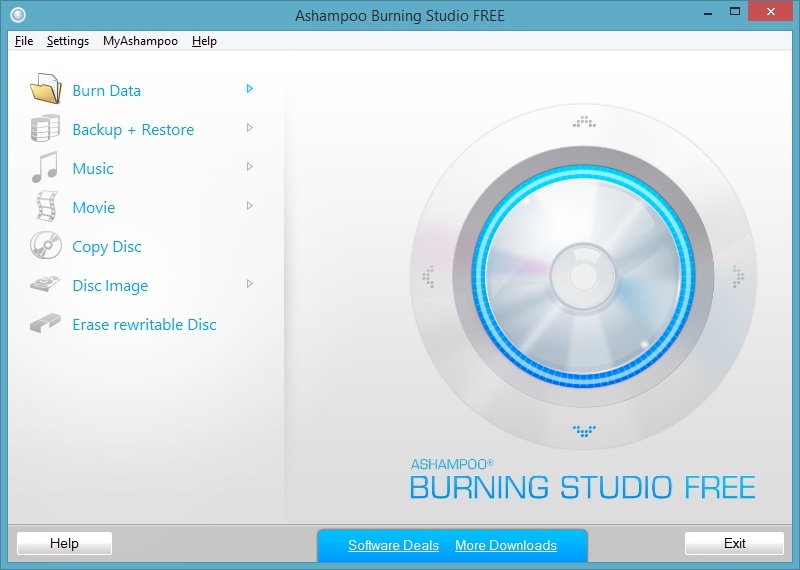 Ashampoo Burning Studio FREE focuses on what you want: To burn discs quickly, easily, with maximum quality and minimum hassle. It includes everything you need to be able to do that. And it excludes everything that could get in the way." the company's description reads.